Rishi: Congratulations Guruji for completion of the first phase of your mission! Guruji: It’s not my mission… It’s His mission! It’s Babaji’s mission, I am just an instrument in His hands. Rishi: So what had been the achievements of first phase? Guruji: It’s not the matter of achievement! It’s all Babaji’s blessings. Thousands of people worldwide are practicing Kriya Yoga and Meditation regularly. So many of them have become Clairvoyants! They can now see Aura with naked eyes! Many of them have developed the ability to see astral beings, and can even see Chakras with naked eyes!! Some of them are even able to see causal bodies and Akashic records!!! These abilities are more like confirmatory tests and give the participants’ lots of confidence and empowerment to progress further. All of them have become more kind, loving and compassionate human beings, which is more important than their clairvoyant abilities. It’s all the blessings of Babaji! Anybody practicing Kriya and Meditation on regular basis will become a better human being; there is no doubt about that. Rishi: Are you happy with the progress of your people? Guruji: Yes, with blessings of Babaji, ours is the group which is practicing Kriya and Meditation in highly scientific manner with documentation and results are proven repeatedly by scientists. The growth of people who practiced Kriya and Meditation on day to day basis had been amazing. Hundreds of practitioners got enlightened and are very happy! They are slowly getting rooted in to Shiv-vyapti and preparing to spread the light! Rishi: What is the road-map to future? Guruji: One thing we must continue is “Systematic approach to learning”. All the results produced in such a short time are because of this systematic approach and the universal breath based training methodology which has produced amazing results. Anyone who progresses on the path with systematic approach will get the results. Attitude of learning is must! Also, on the path of spirituality, one should not be “alpa-sukhi” (satisfied with little). Keep learning and keep progressing. Divine discontent is a virtue! We are really blessed to have amazing tools and techniques and great knowledge from scriptures from Kashmir Shaivism, Ashtavakra Gita and Tripura Rahasya. Our next phase is to get more focused on making of Masters. Masters who can teach Kriya Yoga, Meditation, Do Shaktipat and Shivapat and help spread enlightenment education. We will be doing lots of “Train the Trainer” programs in near future and prepare hundreds of Masters to carry on with His mission. We also need to systematize the certification procedure so that non-competent and untrained people do not get in to unauthorized teaching which can be harmful to people. All those senior seekers who are interested in getting training in how to initiate others in Kriya Yoga, will be given systematic training and prepared in a right manner to carry on with Guru-karya. It gives me immense pleasure to share this information with you that so many people have responded to my e-mail and SMS about doing Guru-karya, and the inflow of confirmation continues… Now I have no doubt that we will be progressing at a very fast pace and with blessings of Babaji, thousands of more people will be walking the path of liberation through Kriya Yoga. Liberation is easy this way because of so many confirmed milestones and ways of quantum jump! This was kept hidden for such a long time! Babaji is helping us to open up the knowledge to those who care for it and practice GRATITUDE. It’s a great journey! Very thrilling and also satisfying!! 20 Years back, I had never thought that the Path to Enlightenment can be systematized to such an extent, that anyone who has attitude of learning can understand it so completely, in such a short duration!! His GRACE is immense! All those who practice GRATITUDE will make themselves eligible to receive His GRACE. Awareness and Understanding needs to be constantly upgraded to grow as human being. Love and compassion are the virtuous outcome of the enlightened state. Rishi: Guruji, would you please elaborate on phase 2 of the mission? Guruji: We have been chosen by Babaji for spreading Grihasthionka Adhyatma - Householders’ Spirituality. With unflinching support from Guruma in every activity of Guru-Karya we have come so far. In 1860 Sri Lahiri Mahashaya had been chosen for the same reason. We are continuing on the same lines of House-holders’ Kriya Yoga. On this path Sanyas is NOT necessary to evolve spiritually. You can continue to do what you are doing, it may be a Job or Business, be with your family and as a normal householder you practice Kriya and Meditation on regular basis to walk the path of liberation. This kind of Spirituality is not at all against your Grihastha Dharma which also includes your married life and your material well-being. 99.9% people on planet earth are house-holders but 90% spirituality is promoted and dominated by Sanyasis and Avadhootas and Aghoras and like…making householders feel helpless at times! Every householder seeker gets this thought once in a while – A Sanyasi has all the time and has no responsibility of household so he can walk the path of spirituality but how can I - as a householder with a family and all the associated responsibilities and very little time for spiritual practices - can evolve spiritually? So, we have started working hand in hand with our householder friends. Thousands of couples have been initiated in to Kriya Yoga. They are walking the path of “Seven dimensional Prosperity” through Kriya Yoga and many of them have evolved in wonderful ways. They are able to manage their responsibilities very well and also find time to do their spiritual practices. We have also introduced “Prosperity Yoga” recently for those who are worried about their material well-being and “work-life balance” which is very important for a householder. In Phase 2 of His mission we have been directed by Him to work with couples and families and initiate them in to Mokshadayini Kriya. This is one of the higher Kriya (Ucha-kriya) and ideally suitable for householders with little time for their spiritual practices on day to day basis. This path brings about harmony in the family and helps everyone in the family to evolve materially as well as spiritually. It is a very balanced path! Also, lots of messages have come from Babaji for Karmakshalan Kriyas. Those of you who have attended Bali International camp have experienced the power of Water and Fire Kriyas as karmakshlan process. Kriya Yoga has made “Living Enlightenment” possible for thousands of couples! 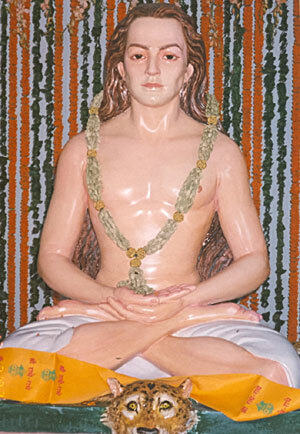 The major role was played by SHIVAPAT experiences and the CLARITY of UNDERSTANDING given by Babaji. Once that AWARENESS and UNDERSTANDING settles in your being, Living Enlightenment is easy! Rishi: Please tell us something about the scientific research work and its importance in phase 2 of the mission. Guruji: Since childhood, I had been associated with many spiritual organisations such as Chinmaya Mission, Ramakrishna Mission, Brahma Kumaries and many such organisations. I had also been influenced by members of Andha-Shraddha Nirmoolan Samity. The reason being, most of spiritual practices I saw in India, I noticed that most of it was based on BLIND FAITH (Andha-Shraddha) and very little TRUTH. Many hotchpotch Babas talking mumbo-jumbo spirituality wanted their “followers” to have faith in them and their words while it never made any sense to a scientific mind. I also saw lots of exploitation of ignorant people going on in name of spirituality. An “Avadhoot” tantric Baba was circulating Chappaties with tea leaves spread on it that would double in few days! (It was nothing more than a case of fungus, scientifically speaking!!) When I started travelling out of India, I saw similar things in Gulf countries as well. One of my students showed me those chappaties with great reverence for a baba and she described how it doubles in every home and she was to continue the chain of this non-sense!! I had mixed feelings by being with her. She was well educated and working in corporate world and yet so gullible and absolutely no scientific understanding. Seeing all such incidences, I decided that we, as a group, must strive for scientific spirituality. Great Masters are very compassionate and had been giving us wonderful knowledge. For us there is no need to doubt it or to prove it… But, the modern world does not believe in mere words. Modern youth – not only in India, but everywhere in world – have started asking questions, seeking scientific proofs. Hence I decided to cooperate with all those scientist friends who were keen on doing research work. The first one was a Russian lady, Dr. Ludmila from Healthholistic.com Dubai during my first visit in 2008. She had most modern Bio-Feedback machine that worked on auric field sensors and represented the functioning of various organs through graphs. When my scanning was going on, she called all her scientist friends and all were surprized to see the amazing coherence represented by graphs. Dr. Ludmila wanted to know how exactly it is possible and I taught Kriya Yoga and Holistic Health Exercises to their entire family. This was the beginning of our scientific work. After this during my visit to Muscat, our friends from Sultan Qaboos University wanted to see functioning of my heart and brain. The serious experimentation and documentation started but that was not enough. So, we started a scientific wing with a team of scientists to do systematic documentation of effects of Nirmal Kriya and Nirmal Dhyan on human heart and brain. Our team is doing amazing work and soon we are going to have a Mega Event to share the results with every one of you and also publish it in medical journals so that future generations can do the further research work on Kriya Yoga. In India, we have amazing knowledge in various traditions but because we do not have scientific temperaments and habit of documenting the results of experiments we cannot tell the world about Yoga with great confidence. With scientific proofs published in reputed magazines and medical journals, it will give good background support to our ancient wisdom and our future generation will do further research with great confidence! This is all as per the divine game plan. Long back it all was read by a naadi-shashtri (palm leaf reader). It was mentioned in that palm-leaf that to prove the effects of Kriya Yoga in scientific manner to the whole world was a part of mission! Babaji’s mission is amazing! He takes care of everything. We simply have to put our efforts without any doer-ship. Thank you for sharing a valuable information! !